Winter biking is the word. 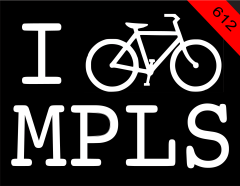 Check out Calhoun Cycle's site - K-mac's bike somehow made the front page; equipped with Panaracer T-serv's, showing you studs are not required for MPLS winter riding. Speaking of which, the Schwalbe Winter tires look pretty sweet; Hiawatha Jim has them as well, that is if you can figure out when his shop is open this time of year. Karla is in town from Rome, she certainly isn't riding anything other than a set of ordinary summer slicks through this now icy mess; it can be done, experience and confidence helps quite a bit. Who else is working this week? This seems to be the week that most countries give their employees the week off, based on our own experiences with-out-of-office email notices, not in the US though.